This book is on the current state of software development, should be required reading for anyone entering the programming field. Any programmer that is currently and dogmatically following any methodology should be handed a copy of this book. Addressing general readers as well as software practitioners, Software and Mind discusses the fallacies of the mechanistic ideology and the degradation of minds caused by these fallacies. Mechanism holds that every aspect of the world can be represented as a simple hierarchical structure of entities. But, while useful in fields like mathematics and manufacturing, this idea is generally worthless, because most aspects of the world are too complex to be reduced to simple structures. Our software-related affairs, in particular, cannot be represented in this fashion. And yet, all programming theories and development systems, and all software applications, attempt to reduce real-world problems to neat hierarchical structures of data, operations, and features. Using Karl Popper's famous principles of demarcation between science and pseudoscience, the book shows that the mechanistic ideology has turned most of our software-related activities into pseudoscientific pursuits. Using mechanism as warrant, the software elites are promoting invalid, even fraudulent, software notions. They force us to depend on generic, inferior systems, instead of allowing us to develop software skills and to create our own systems. Software mechanism emulates the methods of manufacturing, and thereby restricts us to high levels of abstraction and simple, isolated structures. The benefits of software, however, can be attained only if we start with low-level elements and learn to create complex, interacting structures. If you are in school learning to program, read the book. If you program for a living, read the book. If you manage programmers, read the book. If you are thinking of investing in a software system, read the book before you buy. 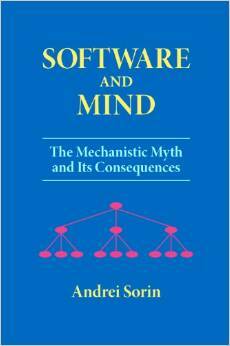 Above all else, if you find yourself clinging to the dogma of some methodology, take the time to read "Software and Mind: The Mechanistic Myth and its Consequences" by Andrei Sorin, PhD. It may open your mind to some possibilities.